Lantana cultivars are aromatic shrubs or herbs cultivated for ornamental purposes for its different flower colors in addition to its use as hedges in Egypt. 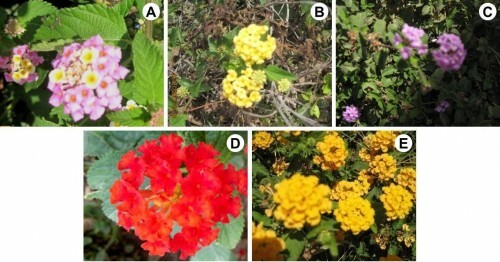 The similarity of the morphological characteristics between Lantana camara and L. depressa varieties lead to carry out the present study where five varieties cultivated in Helwan University Garden, Egypt of red, dark purple, pale yellow, dark yellow and mixed colors flowers varieties has been done on the bases of morphological, chemical study to determine total antioxidant compounds, total phenolics and flavonoids, total anthocyanin content, total carotenoids content, total proteins, and nucleic acids contents for the flowers of each cultivar, in addition to the molecular levels on the bases of DNA barcoding level where the Internal Transcribed Spacer (ITS) discriminate and confirm the identification of four Lantana ornamental plant varieties at the variety level. Fig. : The collected samples of different colors: A, Multicolor; B, Pale yellow; C, Deep purple; D, Red; E, Dark yellow samples respectively.